Inspiration is what gets me up in the morning and makes me think about each day as an opportunity for growth, strength, and resilience. In 2005, before I opened Secession, I took a trip to Vienna, Prague, and Venice. While I was walking down an alley in Prague, I discovered a street artist named Swoon. I had never seen someone do a wheatpaste with so much emotion and strength. I opened the gallery in 2007. One day I was walking in the Mission at 24th/Harrison and to my surprise, a mural by Swoon graced the side of a liquor store. This happenstance in finding her art in SF moved me, and I still find myself visiting this art when I have a free moment. For my 40th birthday, I got this art tattooed by the talented Anne Williams at Mermaids Tattoo. 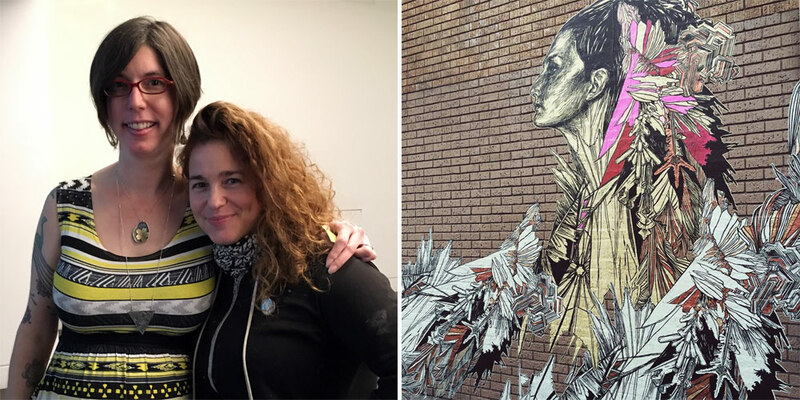 Recently, I got to attend an artist's talk with Swoon and see a gallery exhibition of her beautiful work. Afterward, she almost cried when she saw my tattoo and we had an amazing conversation. This is a moment in my life I will never forget. If you are looking for your 2019 inspiration, check out Drawing From Experience with Shane Izykowski and Sonia Leticia, episode 39. They feature the entire artist talk with Swoon. I am so thrilled they captured this talk and know that I will return to her wise words when I need support to show up each day and love my community. "When my grandmother died, I was snowed in on a mountain and I couldn't make it to the funeral but there was all this snow. I remember looking at the ice crystals and how delicate they were. I was thinking about how my grandmother was somebody they considered so hard that they called her the ice queen. I was like, what is that moment when an ice crystal just forming when it is so delicate and beautiful? Where is that moment in my grandmother's life when she was still this delicate and beautiful human who wasn't such a hard person? So this is my portrait of her trying to understand that moment, to try to understand that transition in her life and celebrate her."